For the majority of Indonesian, bamboo is a natural component that can't be separated in daily life. From the birth to the death, bamboo always geta the place. Household appliances, building materials and many more are some goods made from bamboo. Even one of the local culinary named "rebung" is made of young bamboo shoots. Bamboo also is a tool and symbol of the struggle of Indonesian independence against imperialist which known as "Bambu Runcing". Nowadays, bamboo is popular after it has been used by Indonesian artist to make several traditional music instruments such as : suling (flute), calung, munsang, clempung, rengkong, and the special one which has been listed as world cultural heritage also recognized by UNESCO in 2010, Angklung. Angklung is a traditional music instrument made from pieces of bamboo. This angklung consist of 2 until 4 tubes which is assembled into one by using rattan ropes. The bamboo tubes are carved and cut nicely by the professional wood carver to get specific tone when the bamboo frame shaken. Word "Angklung" comes from sundanese, 'angkleung-angkleungan' means the motion of angklung player, also it comes from the sound of angklung itself, 'klung'. Actually, Angklung is the further development of calung, a Bamboo tube that got hit, meanwhile the angklung is bamboo tubes that got shaken, so it only generates one tone for each instrument. In the past Sundanese, angklung has a function in religious ritual such as inviting the Goddess of Prosperity, Sri, to come down into the earth, bring and give the fertility of the rice field. Until now, in some villages we still can find ceremonies which use "angklung buhun" for traditional activities like harvest party, pesta panen, ngaseuk pare, nginebkeun pare, ngampihkeun pare, seren taun, nadran, helaran, turun bumi, and sedekah bumi. Even though, generally, it's identified as a musical instrument from Sundanese, but the origin of angklung itself may be more extensive and older. One of reference that can be found in the second edition of the bulletin of Sama Nyata in 2009 which is published by the Ministry of Culture and Tourism mentioned that Dr.Groneman on his research, angklung has become a favorite art attraction in whole Nusantara even before the first Hindu kingdom exist. Meanwhile, according to Kunst Yaap said that angklung exists also in South Sumatra and Kalimantan, Lampung, East Java, and Central Java. In Bali, angklung is played for several rituals such as cremation ceremony, ngaben and many more. Even, some claim that angklung comes from Balinese word, 'angka' and 'paru-paru' means complete tunes. In West Java, angklung has been played since 7th century. 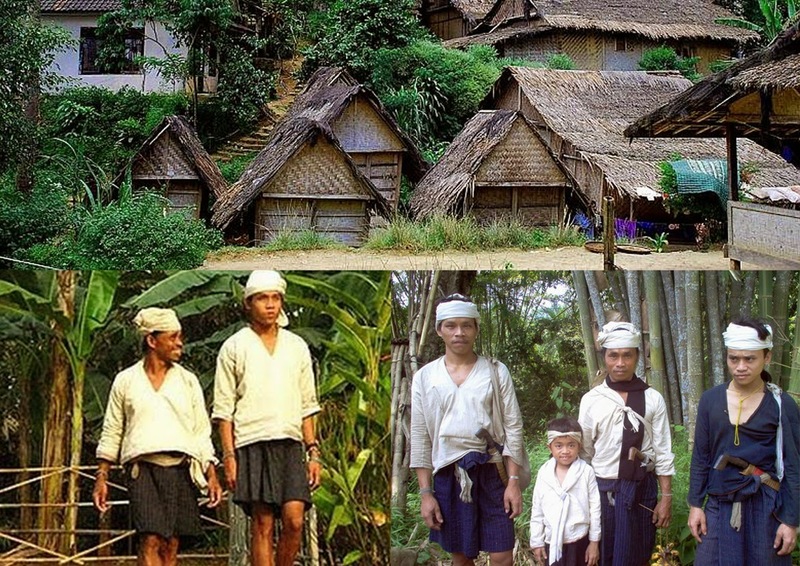 Baduy from Kanekes village still play traditional angklung called 'angklung buhun' in several traditional ceremonies. Angklung of Baduy consist of 4 parts : king - king, indo, panempas, dan gong - gong. In the border between Cirebon and Indramayu, exactly in Bungko village, there is another kind of angklung named 'Angklung bungko'. Believed that Angklung bungko is around 600 years old and it's still maintained even though it's not used anymore. Angklung bungko was created by Ki Gede Bungko, a religious leader which use it as a media of missionary endeavor of Islam. There's also a story from the harvest failure in Cipining village, Bogor which then become the origin of Angklung gubrag. Said that the village is threatened of famine because of the failure of harvest. The village people believe that the disaster happened because of the anger of Godess Sri. Then, The local people made a ritual with the art show to invite back Godess Sri to come down into the earth and give her blessings for the fertility of rice field. However, it was not succeed. One day later a young man named Mukhtar and his friends went to Mount Cirangsad to tear down the bamboo, type of gambang surat. After they meditated for 40 days, they came back to the village and made angklung from the bamboo they got. The next, the young men teach the villagers to play angklung. In the end, the village held a ceremony accompanied by music from angklung. The ceremony was succeed and effective and made the rice field grow well. The people believed the angklung sounds made Goddess Sri came down from the heaven and blessed all their harvest. Therefore, the angklung was named with 'gubrag' means fall or go down. The Angklung Gubrag always fill every traditional ceremony in Cipining village, since the time. In 1938, a teacher from Hollandsch Inlandsche School (HIS), Daeng Soetigna, in Kuningan, West Java succeeded to create a kind of angklung with modern music tones. At first, Angklung only has pentatonic tones. In 1938, Daeng Soetigna modified the Angklung sound from pentatonic tones into diatonic tones. This Angklung known as Angklung Daeng or Padaeng Angklung. Since the time, Angklung starts to be known internationally where it has been staged in Asian-African Conference at Bandung in 1955. Angklung at this time is more often shown in orchestra and more often used as school musical instrument. Daeng Soetigna died in 1984. Then Udjo Ngalagena as his student and assistant tried to conserve and develop Angklung, further. 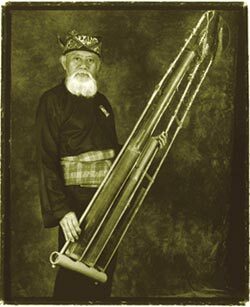 Udjo Ngalagena which usually called as Mang Udjo and his wife, Uum Sumiati, succeeded develop Angklung become more interesting. At the end, they build Saung Angklung Udjo. Besides as traditional musical instrument, it also has philosophy value. Angklung symbolize the life of human who always need each other. The big and small tube from the bamboo row describe the development of the life of mankind. The small one describe each person has a dream and desire to be a great person which is symbolized by the big tube. When the Angklung is shaken, all tubes create harmony which describe the life as it should be.